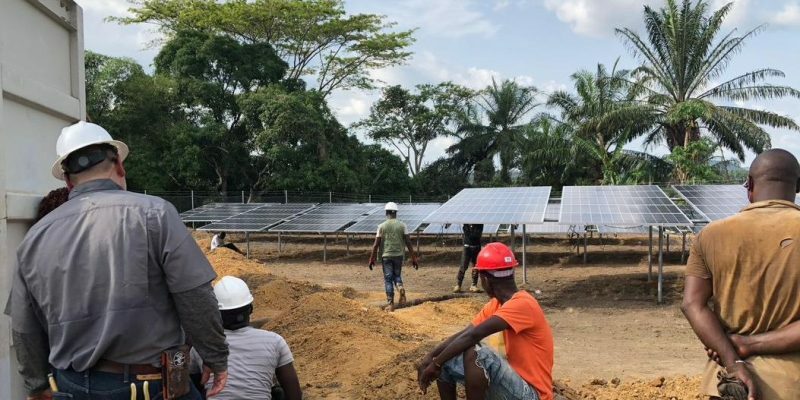 Bandera Electric Cooperative (BEC), a citizen electricity cooperative in San Antonio, USA, has just installed a 70 kW solar power plant in Liberia, in the small town of Totota. The plant will be managed by a local electricity cooperative created on the occasion. A citizen electricity cooperative in San Antonio, southern Texas, USA, has developed a solar, micro-grid and storage project in Totota. The 400 households and businesses in the small town of Totota are now thinking about how they can benefit from their brand new access to an electricity grid. In the community of 6,500 inhabitants, located in eastern Liberia, two main issues are stirring people’s minds “to create new businesses, or to increase working hours and therefore employment, for those that already exist”, said William Hetherington, CEO of Bandera Electric Cooperative (BEC). Totota is a rural community that houses shops, workshops, restaurants, schools, clinics, churches, mosques and government offices. Despite the city’s status as a regional shopping centre, most households have relied on batteries, lanterns and candles for lighting, while a small number have purchased electrical services from a few rare individuals who own and operate small generators. However, all this will change as BEC has installed a 70 kW solar power plant in Totota with 220 photovoltaic panels and a 90 kWh lithium-ion battery, as well as a backup generator. The American cooperative carried out this project with the support of the National Rural Electric Cooperative Association (NRECA), which oversees all non-profit utility grid cooperatives in the United States. The project cost $600,000 and two thirds of the invoice was paid by BEC, as part of a public-private partnership. While the details of prices per kilowatt and operating time have not been specified, it is known that the management of the plant is now carried out by the inhabitants themselves, who have organised themselves within the Totota Electric Cooperative. According to the local TV channel of San Antonio (USA) Ksat TV, affiliated to ABC, the cooperative has secured a return on investment and, even if the cost of energy in Totota will probably remain low, the local cooperative will nevertheless produce a result that will also benefit BEC. William Hetherington said that this benefit will help reduce the amount of financial contributions from members of this American cooperative. Undoubtedly, this small win-win miracle is due to the exorbitant cost that Africans are currently paying for fossil fuels. An electricity cooperative managed by a local public utility is a group of inhabitants at the communal or regional level, which promotes decentralised, ecological and independent energy production from large groups. In the case of the BEC, the economic model is based on the installation and operation of facilities to generate electricity from the sun. The American cooperative is multiplying its actions in Africa. Hetherington said that his cooperative hopes to finalise another project in Uganda soon.